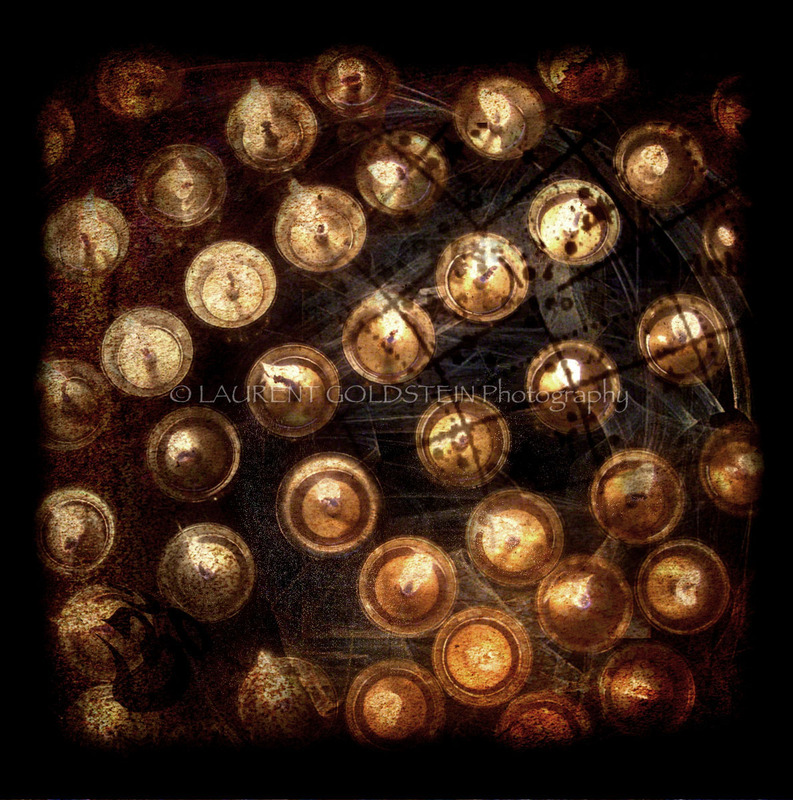 “I have made this body and mind a sacrifice, a sacrificial offering to the Lord. The Khanda is the symbol of the Sikhs, as the Cross is to Christians or the Star of David is to Jews. 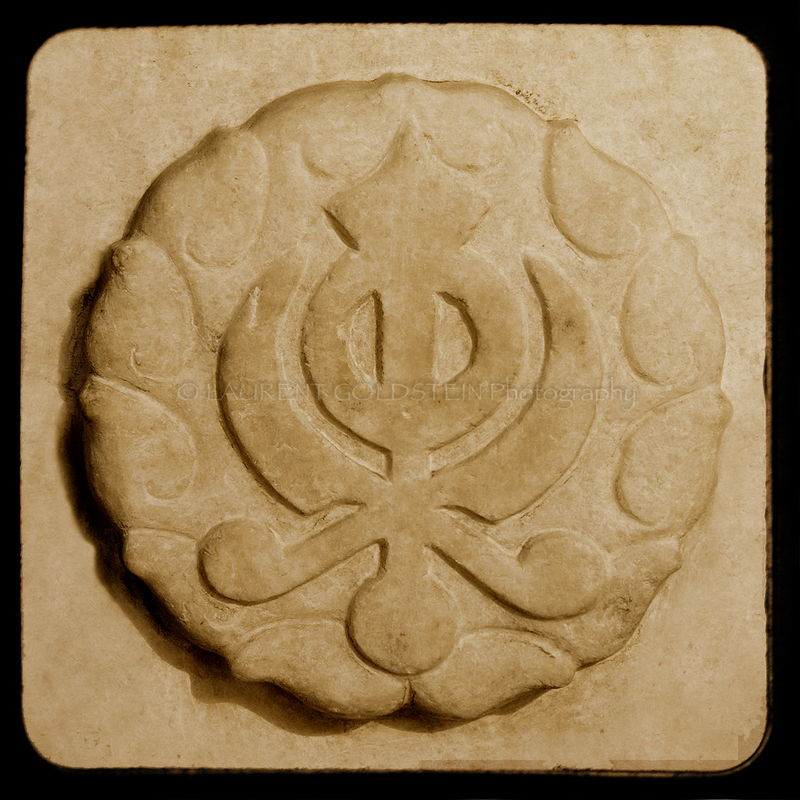 The khanda is like a “coat of arms’ for Sikhs. It was introduced by the sixth Guru, Guru Hargobind Ji. It reflects some of the fundamental concepts of Sikhism. The symbol derives its name from the double-edged sword (also called a Khanda) which appears at the center of the logo. This double-edged sword is a metaphor of Divine Knowledge, its sharp edges cleaving Truth from Falsehood. The Chakar around the Khanda is a circle without a beginning or an end, it symbolizes the perfection of God who is eternal. The Chakar is surrounded by two curved swords called Kirpans, they symbolize the twin concepts of Meeri and Peeri – Temporal and Spiritual authority introduced by Guru Hargobind. 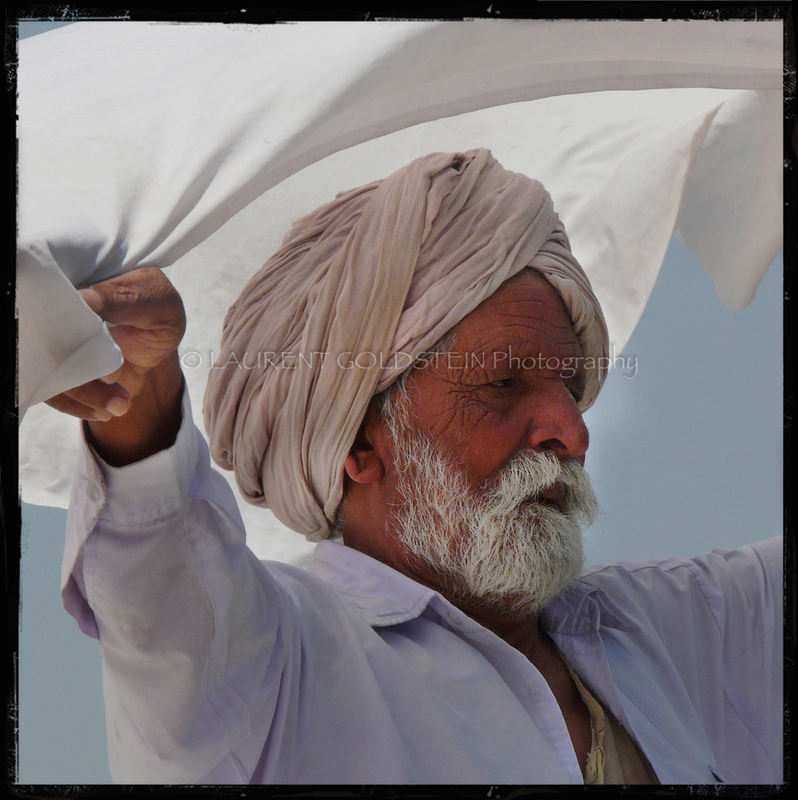 They emphasize the equal emphasis that a Sikh must place on spiritual aspirations as well as obligations to society. This picture wa shot at the Gurdwara Bangla Sahib which is located near Connaught Place in Delhi. This man was sitting before sunset along the samovar of the Golden Temple which is located in Amritsar in the Indian state of Punjab. The amazing spiritual presence coming from the Harmandir Sahib makes anyone easily feel that this place is Heaven’s gate. This guard holding a spear was walking along the samovar of the Golden Temple which is located in Amritsar in the Indian state of Punjab. 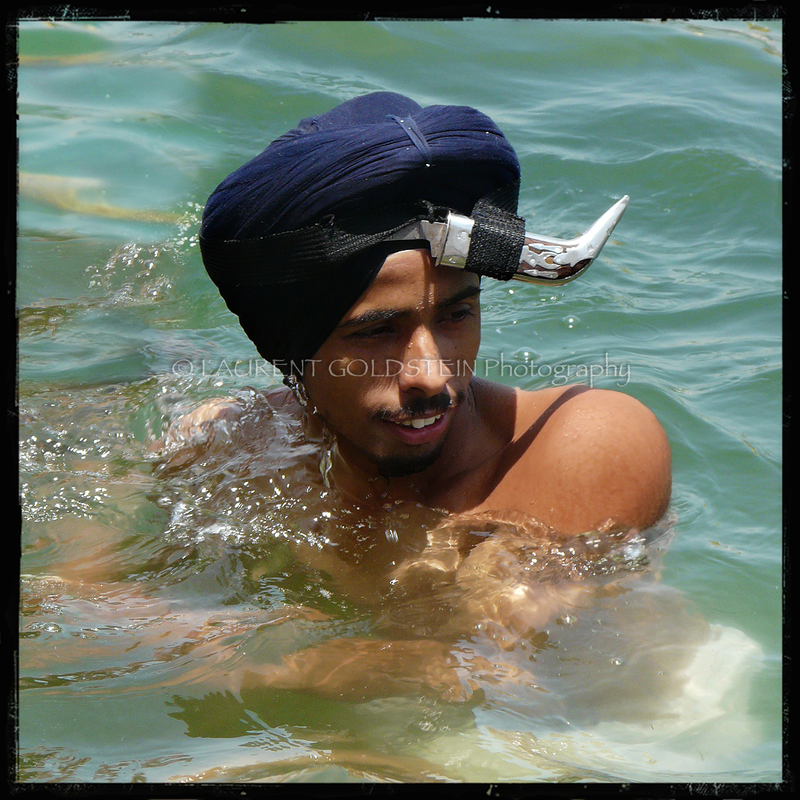 This young man was bathing in the holy tank of the Golden Temple of Amritsar, the holiest city in Sikhism, located in the Indian state of Punjab. 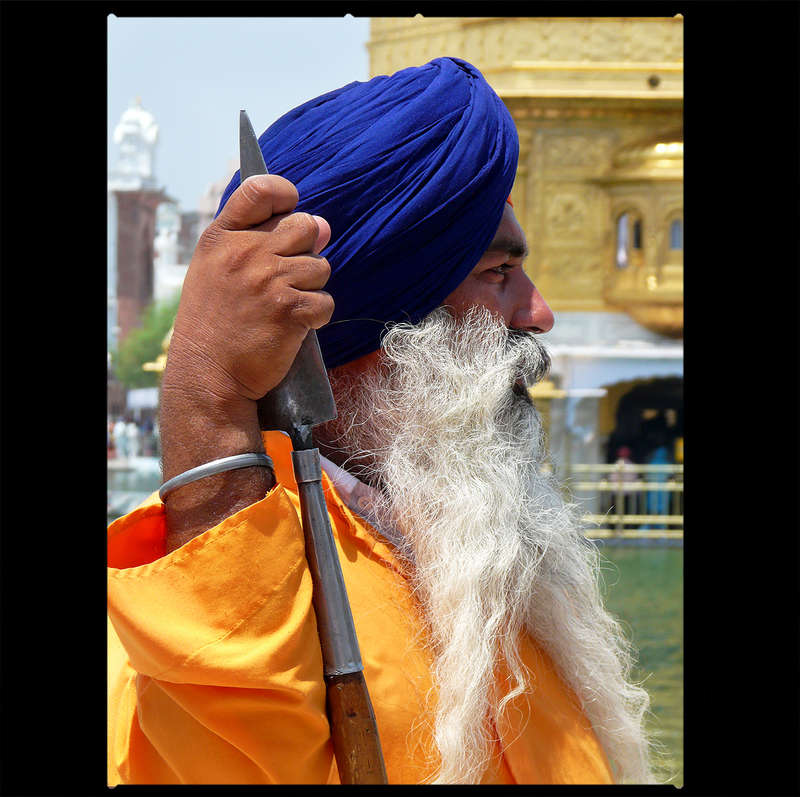 He left his Kirpan (steel sword) in his turban in order to keep this symbol of his faith with him and, like most of the people who come to the Harmandir Sahib, there was a real happiness flowing around him. 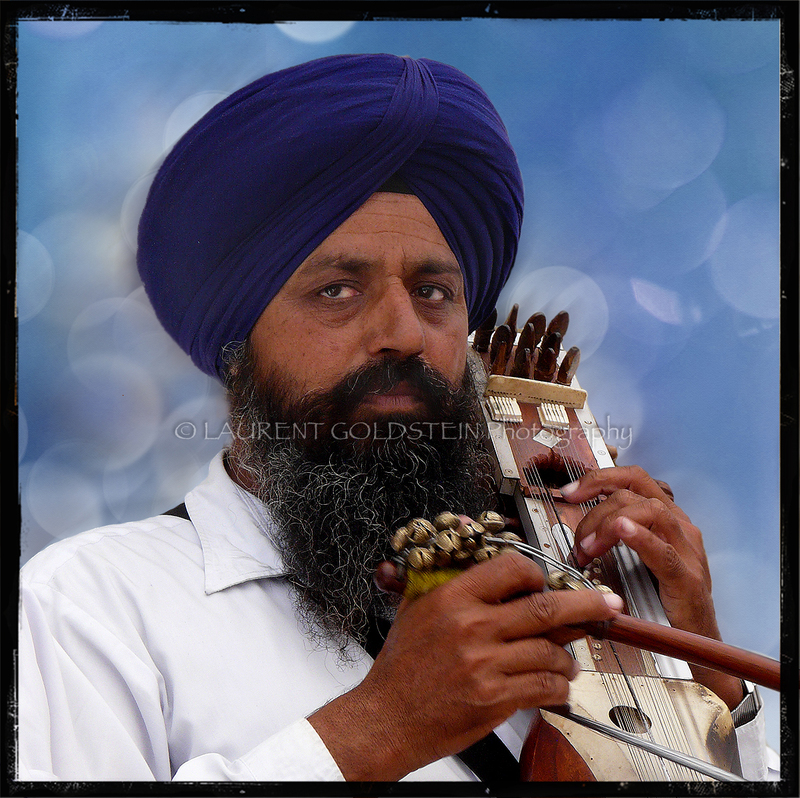 This musician was among a group of people playing music in front of the Harmandir Sahib, the Golden Temple in Amritsar, the holiest city in Sikhism located in the Indian state of Punjab. “Those who conquer their minds are beings of renunciation and detachment. After taking a deep in the Immortal Nectar of the Harmandir Sahib, this man was putting his clothes back on him. He spread that fabric over his head which allowed to give a deeper significance to this portrait. 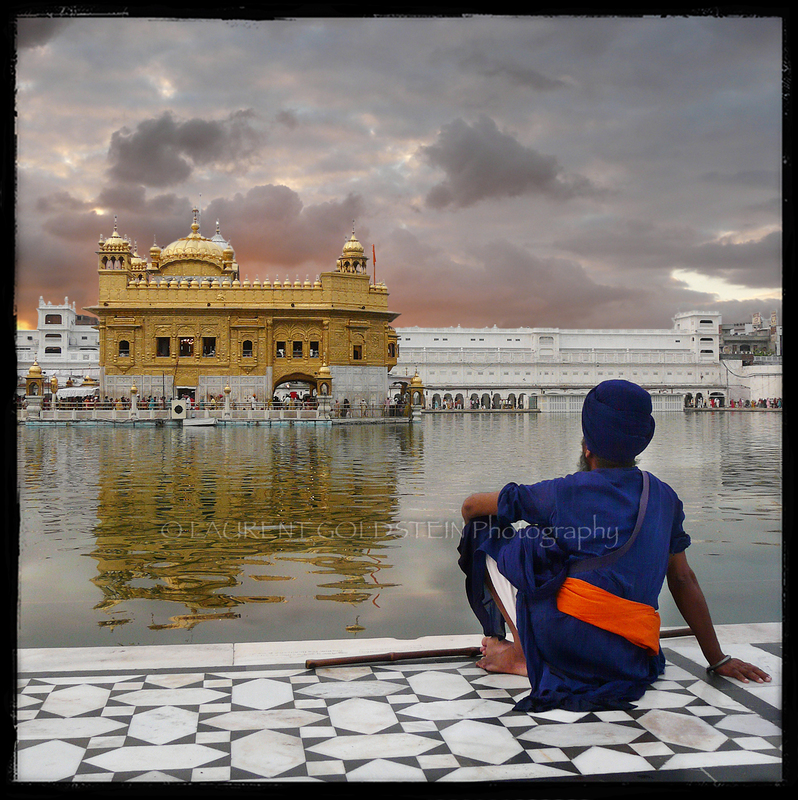 The Golden Temple is located in Amritsar, the holiest city in Sikhism, in the Indian state of Punjab.